For spring 2013, carrier AT&T is all set to promote the new HTC First as its flagship smartphone. Having announced the availability of the model on April 12, the carrier is offering the new HTC device preloaded with Facebook Home along with a two-year agreement for a reasonable contract price of just $99. The reason why AT&T chose the First to represent its brand and act as the flagship model for the upcoming months is the fact that the First will only be available with the carrier for the time being. HTC First with ‘Facebook Home’ launches as an AT&T flagship. The HTC First has been receiving a lot of press lately thanks to its collaboration with Facebook which officially launched it as the phone that will have Facebook Home loaded into it right out of the box and we can expect more of the same in the coming months as AT&T is sure to milk the phone and the social network’s popularity for all it’s worth. Customers that buy the HTC First with an AT&T contract would be able to experience the 4G LTE that has been dubbed the speediest 4G LTE internet network provider in the States by RootMetrics, the independent mobile research firm. The main eyeball grabber that HTC is counting on to boost the sales of the First is the Facebook Home feature. The smartphone will get the new feature preloaded into it which makes it the best gift for people that are addicted to the social network. With Facebook Home, users would be able to access the News Feed from their account right on the home screen of their First without having to access the site through an app or through the browser. The screen will also bring real time updates right the fore and users would also be able to use Facebook chat right from their phone’s home screen. People that need to use Facebook all the time like social media managers etc. would find this feature of the phone particular attractive while features like Notifications, Chat Heads, App Launcher and Instagram would make the HTC First the first phone of its kind to bring the maximum functionality of the full site to a handset. The HTC First will be offered with a long lasting 2200mAh battery, Bluetooth 4.0, NFC, a front-facing 1.6MP camera and a rear-facing 5MP camera, 16GB of internal storage, 1GB RAM, a Snapdragon 400 processor from Qualcomm with a dual-core CPU and a 4.3-inch 341PPI display. 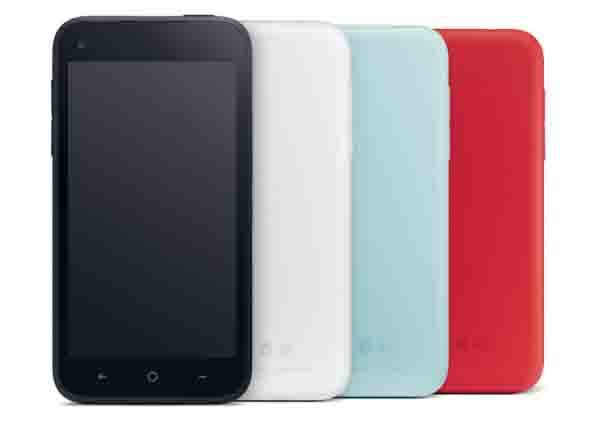 Running on Android 4.1 (Jelly Bean), the First will be offered in pale blue, red, white and black colorways. The HTC First can be purchased now through an AT&T store or outlet for $99 for a two year contract.